Follow live text updates and audio commentary from AFC Bournemouth against West Bromwich Albion. Debutant Ahmed Hegazi gave the hosts a headed first-half lead, and despite an increased attacking threat after the break, the Cherries we unable to redress the balance. Nathan Ake and Asmir Begovic were selected for their first appearances since re-signing for the club over the summer, Steve Cook won his fitness race to start, while Jermain Defoe was on the bench following a pre-season groin injury. 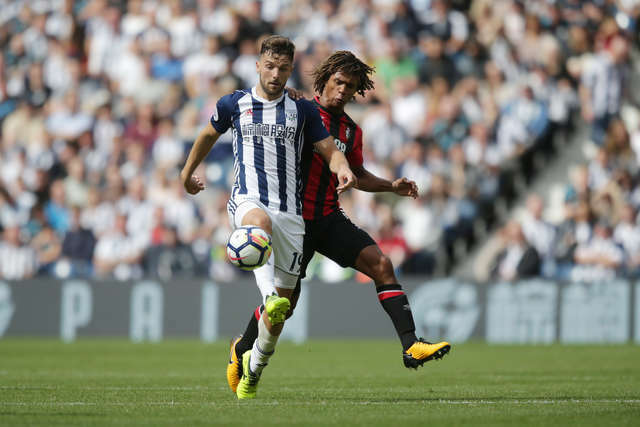 West Brom’s summer signing Jay Rodriguez had the game’s first shot, driving at Begovic from 20 yards after two minutes. The former Southampton striker soon gave the Cherries’ keeper even more to do, Begovic down smartly to block a six-yard shot after the ball dropped to Rodriguez after a long throw. The hosts were having the better of the first 15 minutes, Rodriguez and Begovic continuing their personal battle. The Bosnia international saving from the striker for a corner before the same player headed the resulting set-piece over the bar. Rodriguez’s quest for the opener next saw the 28-year-old swerve a shot past the upright, though it was the Cherries beginning to enjoy the lion’s share of possession. However, after 31 minutes West Brom took the lead that their start had threatened. After a foul on the right-wing Chris Brunt had the opportunity to deliver a cross, the left-back’s aerial centre finding Hegazi, the Egyptian firmly heading home at the far post. In similar circumstances Bournemouth were nearly level within three minutes. Fraser’s set-piece from the right allowed Benik Afobe to challenge Brunt, the ball ricocheting off the Baggies defender and only marginally wide of Ben Foster’s upright. 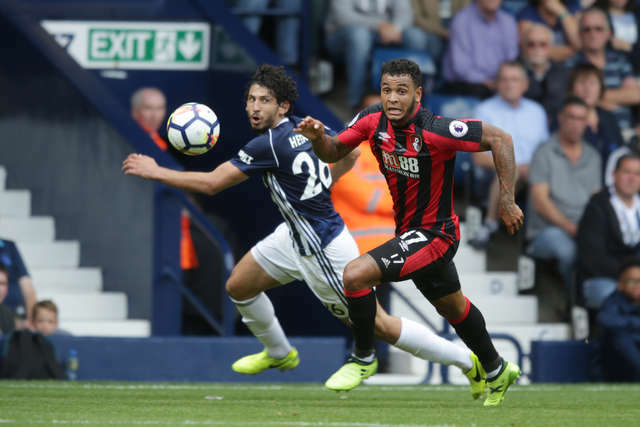 Closing in on the break Hegazi again caused danger when his flick on from a corner gave Claudio Yacob a free volley at the back post, but the West Brom man could only fire across goal and wide. Eddie Howe made a change to his line-up to start the second half. Jordon Ibe replacing Marc Pugh on the left flank. In similar fashion as for much of the first period, Bournemouth looked comfortable on the ball but besides a flashing Harry Arter strike off target, the away side struggled to make attacking inroads. A last-ditch Afobe defensive intervention cleared a Baggies corner before Yacob planted a header into the side netting from another corner. The Cherries’ attacking intent increasing, King had a shot blocked following a well-worked corner, then just past the hour mark Defoe replaced Afobe. Cook needed to make a smart tackle after Jake Livermore’s through ball came close to finding James McClean in the clear. Into the final ten minutes, Fraser’s ball into the box was flicked on and towards goal by Ake, but the Dutchman’s effort was directed too close to Foster, who calmly caught. Ibe, a bright spark from the bench, looked to thread a ball through for substitute Adam Smith but it was just taken away before it reached the full-back. Into the five minutes of added time, Begovic was at full stretch to tip Salomon Rondon’s shot on the break round the post. Fraser had a late shot saved by Foster, the Cherries falling to their third consecutive first-day loss in the Premier League.